Residential 80% furnaces made in the last 30 years with air-conditioning coils on the discharge (outlet) of the furnace do NOT allow carbon monoxide to enter the indoor air stream. Period! My concern is that everyone concentrates on the heat exchanger in the furnace and ignores or overlooks the circumstances in a home that actually cause carbon monoxide poisoning. Those issues have NOTHING to do with the heat exchanger, cracked or otherwise. Simple things like blocked or broken flues, open return-air panning or open return-air ducts near the furnace or insufficient combustion air are the causes for the majority of carbon monoxide issues. Howard Leonard is president of Total Tech HVACR Training, Phoenix, AZ. His firm specializes in service, installation, and application training for service technicians. He can be reached at 602-943-2517. 2. Pulling more air into and through the combustion chamber. Although both of these situations, for other reasons, are a hazard, in either case, the amount of secondary air is increased, which leans the flame out and reduces CO. Note that the article is dated November 2001, so this isn’t “new” information. It’s been known since the invention of forced-air furnaces. This ACHR News article explains what to look for when inspecting a furnace flue. Here’s an excerpt from an October 1, 2004 Contracting Business Article titled “Carbon Monoxide: Let’s Stop The Madness!” that clearly makes the case that cracked heat exchangers do not make carbon monoxide because of the cracks. Read the article because it highlights a number of areas about carbon monoxide and is directed at the technicians who service gas equipment. MYTH #1 – Cracked Heat Exchangers Make CO. I would like to know who started this myth. CO is produced as a result of incomplete combustion. A cracked heat exchanger might allow products of combustion to enter the air stream. In some rare cases, it can cause flame impingement when air from the blower enters the heat exchanger. I’m not advocating that we shouldn’t replace defective furnaces — we should. The point is: incomplete combustion is what produces CO, not cracks. MYTH # 2 – If It Meets Code, It’s Safe. Code is a passing grade — kind of like getting a D on an exam. Code doesn’t provide protection for every situation. We’ve seen thousands of installations that passed code with flying colors, yet producing obscenely dangerous levels of CO. MYTH # 3 – Blue Flames Don’t Make CO. There’s not enough room on this page to cover this pervasive myth, so I’ll challenge you to prove or disprove this one for yourself. There are a number of other myths about CO.
Flame roll out (left burner) due to hole in heat exchanger. A heat exchanger crack in a residential furnace large enough to cause trouble usually upsets a steady flame or causes the burner flames to roll out the front of the burner openings. This can cause a fire or burned wiring and should trip the “roll out switches”, which are temperature sensors located near the front and above the burners. The roll out and poor combustion performance may cause CO to come out the front of an 80% AFUE furnace and pool in the vestibule of the furnace, eventually filling the utility room with carbon monoxide. If there are loose return-air connections or openings around the air filter, the CO that has accumulated at the front of the furnace could be pulled into the return air stream and pushed throughout the house. The CO does not enter the home via a heat exchanger crack, however it can be pulled into the home by a poorly constructed return air duct system. If the crack or split is really big, it may keep a burner from lighting correctly (or blow it out) and cause a delayed or concussive ignition. In really bad cases the concussion can blow the access panels off the front of the furnace. On older furnaces with standing pilots, a big crack might cause the pilot flame to be blown out, which turns into a no-heat situation. Many times, smaller cracks cause the burner flames inside the heat exchanger to waver back and forth and be blown against the inside of the heat exchanger. At this point, the carbon monoxide output of the flame is raised. But, unless something else is wrong with the furnace, the additional carbon monoxide simply goes up the flue with the rest of the products of combustion. It never enters the home or poses a danger to the occupants. It will affect furnace efficiency but it doesn’t get inside the home. Having said all that, anytime the crack or hole is large enough that it forces the burner flames out the front of the heat exchanger, it is a dangerous situation that should be corrected immediately. This is really what the heat exchanger inspection is all about – to make sure that the furnace is operating safely. In case you are still interested chasing little heat exchanger cracks, read “How Not to Find Cracked Heat Exchangers“. A forced-air gas furnace (upflow or horizontal) is a metal cabinet that has another, smaller metal box inside of it. The cabinet is usually insulated and designed so that the outer surfaces are always cool so that it can be placed next to combustible wall surfaces without creating a problem. The smaller metal “box” inside the furnace cabinet is the heat exchanger. (See the figure above.) (Additional heat exchanger images on Google.) The heat exchanger is where the gas burners are located. The heat exchanger is designed to be heated by the burner flames while the furnace blower moves room air across the outside of it. Under normal conditions, when the furnace is running, the air coming into blower from the house (return air) is generally 60 to 68 degrees F. As the air passes through the furnace, the heat exchanger warms the air. The discharge air coming out of the furnace and moving through the duct work will be somewhere between 40 and 90 degrees hotter than the return air. The heat exchanger is what separates air flow of the fuel burning process from the blower-driven air that moves through your house. This is a box-in-a-box arrangement. When the furnace blower is running, it pushes air through inside of the outer cabinet across the outside of the heat exchanger. The force of the blower-driven air is much greater than the air pressures inside the heat exchanger. As a result, any crack or hole or split results in air being pushed INTO the heat exchanger. There is no way air will move from inside the heat exchanger to the indoor air stream. This applies to residential gas furnaces with an air-conditioning coil mounted on the discharge. The same theory does not apply to commercial furnaces, duct furnaces, roof top units or residential furnaces with an open supply air discharge. They are configured differently and have different operating characteristics. Temperature Rise – Why Should You Care? The increase in temperature between the return air and discharge air is called “temperature rise”. This number is printed on the ratings tag (where the model and serial numbers are) and is used by technicians to make sure that the proper amount of air is moving through the furnace. If the furnace blower is moving too slow, the temperature rise will be higher than the rating. 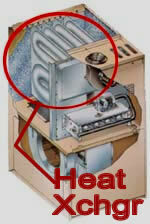 If the blower is moving air too quickly through the furnace, the discharge temperature will be too low. The temperature rise rating dictates the “recommended” and safe range of discharge temperatures for your furnace. A high temperature rise puts additional stress on the heat exchanger, results in higher energy losses through the duct work and can cause a lot of other problems. If the temperature rise is too low, the discharge air might feel cool when coming out of a register, areas of the house may be hard to heat or problems with condensation in the flue or on the inside of the heat exchanger may occur. The furnace blower is sized by the manufacturer to push a certain amount of air through the furnace cabinet. That amount of air is based on the heat output of the gas burners and is a design decision made by a manufacturer’s engineering team. The design takes into account the “average” or expected resistance of the duct work and the air-conditioning coil. They refer to it as total system resistance. When you allow your air filters to get dirty or have an air-conditioning coil coated with fuzz, those “averages” are out the window and the furnace is forced to run at higher than normal temperatures. On a call for heat from your thermostat, the furnace ignition system starts. On really old furnaces with standing pilots, this simply meant that the gas valve opened and the gas was ignited by the pilot flame. On newer furnaces (built in the last 20+ years) the igntion system either used a spark or a glow coil to ignite the gas. Some systems would first spark and ignite a pilot, then the pilot would ignite the main burner. Other systems would use a glow coil or hot surface igniter to directly light the main burner. In all cases, there is an electronic module that “supervises” the system and determines whether ignition was successful and whether the furnace should continue to operate. When the blower is running, it produces enough force to push air through the furnace, through the air-conditioning coil and out through the duct work. This “force” surrounds the outside of the heat exchanger and is always putting air pressure on the outer cabinet and on the heat exchanger shell, from the outside of the heat exchanger. Some mechanics have argued that the speed of the air moving across the heat exchanger would create a “venturi” effect and draw products of combustion from inside the heat exchanger into the blower air stream. That might be a reasonable theory if there were no a-coil sitting on the furnace and the duct work was over sized. Under those conditions there would be very little resistance to air flow through the furnace and the venturi effect might work. depends on the velocity of the gas moving through the burner tube. However, anytime there is an a-coil in the discharge air stream, the venturi theory falls apart. That’s because the a-coil converts some of the velocity pressure to static pressure inside the furnace cabinet. When that happens, the inside of the furnace is pressurized with respect to the inside of the heat exchanger so there is no chance for the venturi effect to occur. Air is always pushed into the heat exchanger whenever the blower is running. It doesn’t matter where the crack is, or its shape; when the blower is on, air gets pushed into the heat exchanger through any crack or hole. The test most-often used to determine if there’s a problem with the clam-shell or sectional heat exchanger is called a “candle test”. Basically they slowly move a lit candle inside the heat exchanger and watch for the flame to be blown around or actually get blown out. If the flame waivers or is blown out, they say the heat exchanger has a “flame disturbance” and needs to be replaced. Some mechanics simply watch the burner flames as the blower starts. If they see a change in flame pattern, color or sound, they know there’s a problem with the heat exchanger. When you ask “well is it dangerous”? They affirm that you could definitely have a problem with carbon monoxide entering the house. Congratulations … you’ve just been “sold”. Because you have a “bad” heat exchanger … you’re going to buy something. Might be a new furnace, or just a heat exchanger (labor extra, of course), but you’re going to have to buy something. The question is, what is the definition of “bad”? Is it a small crack or hole that doesn’t affect operation? Or, is it a crack that may open up to become a bigger crack that causes the burner flames to roll out the front of the heat exchanger? On the Other Hand, here is a tubular heat exchanger problem that no visual inspection, even a camera on stick, would detect. This kind of “heat exchanger breach” slips past almost everyone. The furnace operated, had NO roll out or other symptoms, except for slightly low draft as measured at the draft inducer. The pressure switch stayed closed when the draft inducer was running, so the furnace stayed on. The furnace was replaced when the air-conditioner had to be replaced. That’s when the heat exchanger problem was found. Keep in mind, this isn’t just a problem with Rheem, almost all manufacturers have produced tubular heat exchangers where this issue showed up. This situation would have been uncovered when watching combustion analyzer readings as the blower came on. Using a combustion analyzer gives a clearer picture of how the furnace is operating. It’s another reason you need to call a reputable heating-cooling contractor. Note: don’t shop for clean & check services by price as you will usually get the opposite of what you want. You’ll get the guy chasing little cracks versus someone who has the know how and test equipment to really check for safety issues. The guy chasing cracks needs to find problems and “replace parts” to make money. Here’s where it starts getting dicey. Most gas utility companies have a standing policy (some actually written into local ordinances) that require service mechanics to “red-tag” and shut-down furnaces with a heat exchanger crack. To avoid potential liability, most service companies have adopted similar policies. In thirty years of business, I’ve never seen or heard of a utility employee or a service company mechanic using a calibrated CO tester to see if the furnace in question posed any kind of threat. They simply state that having the crack is bad enough, and shut-off the family’s heat! In many cases, the utility company will come out with a standard environmental CO meter designed to measure CO concentrations in a room. Once they establish that the CO level is indeed elevated, they’ll tell the homeowner to contact a private service company, because there is a problem with the furnace. They never usually ask about whether the stove or oven is on, or whether there are other gas appliances running in the house. Basically, the utility performs a cursory glance at the furnace, water heater and flue or chimney, and then bows out. In areas of the country where the utility service department also sells equipment and does installations, it’s a different story. They may condemn and red-tag the furnace, sell the homeowner a new furnace and actually do the installation. In this case, the homeowner relies totally on one organization. In either case, the family still is forced to endure a cold home with their heat shut off simply because of a minor problem. I’ve been on dozens of service calls where the gas utility told the customer to replace their furnace because of a crack in the heat exchanger that had NOTHING to do with the high CO levels in the house. In most cases, elevated CO was tracked down to the use of attic or window fans at inappropriate times, limited combustion air, or blocked flues or flue caps or other appliances that had been operating in the home. A cracked heat exchanger needs to be addressed. It is usually an indicator of more trouble in the future, and should NOT be taken lightly. If it is a small hole or crack, then it is a minor issue that needs to be corrected – generally by replacing the furnace or heat exchanger. Some holes or small openings may have been there for years. Other splits or cracks, especially big ones that blow the flame around and out the front of the heat exchanger, mean the equipment or heat exchanger should be replaced immediately. If you want to give your service technician a bad day, ask him how the carbon monoxide is supposed to get through the hole or crack in the heat exchanger if the blower is pushing air around and over the heat exchanger and that’s what he’s using to check its integrity. The same blower pressure that pushes air through the duct work and out the registers also pushes against the OUTSIDE of the heat exchanger and forces air into it! This is why heat exchangers need to be checked. and causes the burner flames to rollout, as shown here. Note that small cracks or holes do NOT cause rollout. but they do not have an appreciable affect on combustion. In many cases the cracks have no effect on the burner flames or combustion. Here’s a video that shows what a small rollout looks like. The problem is caused by a heat exchanger that has split open between the halves of the clam shell. When the blower comes on, it forces air into those splits and causes the burner flames to roll out into the front of the heat exchanger. This video shows why the heat exchanger split open. Accidental Proof – Here’s what a heat exchanger looks like. It is worth watching this 10 minute video. This video is by a home inspector and clearly shows how a heat exchanger is positioned in a furnace and how all the hoopla over hairline cracks is bogus. The intent of the video was to show home inspectors that there’s no way they can reliably identify heat exchanger cracks. What he really does, is show in great detail that a hairline crack is convenient reason to condemn equipment and make a sale. He doesn’t say that, but it is plainly evident in the video. The crack location, in this case, is in a position that would not affect combustion or the burner flames. It is a “fatigue” crack that probably shows up in many heat exchangers. Two or three years after the heat exchanger is replaced, it is probable that a crack will appear in the same location. I imagine that the technician that spotted the crack had to lift the air-conditioning coil off the furnace and used a remote camera to even see it. A small crack or hole that is NOT causing a rollout or other problems is NO reason to put a family in the cold, risk water pipe freeze ups, and cause stress over a situation that may have existed for five or ten years and never caused a problem! A pencil size hole or hairline crack in a heat exchanger does NOT, in my opinion, justify shutting off the heat on someone in the middle of winter. In years past, with older furnaces, a heat exchanger crack or small slit could turn into a big, gaping split once the heat exchanger warmed up. At that point the blower could force the burner flame out the front of the furnace and cause a fire or burn up wiring. A heat exchanger hole could also blow out a pilot or keep a row or two of burners from igniting and cause an explosion. These are big openings that cause the problems, not a little quarter-inch hole or two-inch crack. Service mechanics will always argue that there’s no guarantee that the split or crack won’t widen during operation and that is why it is not safe to leave it running. That’s true, but it is also true that a split or crack could open up at any time when the furnace it running. They could have checked the heat exchanger, not discovered any problems, and the crack may develop before the mechanic gets to the end of the driveway. I don’t have firm numbers to back up this next statement, so this is just a guess. But in my experience looking at furnaces, I’d guess that at least 10% of all the gas furnaces in operation today have heat exchanger cracks. Most go unnoticed because they don’t affect operation and do NOT cause increases in carbon monoxide formation. If you have a heat exchanger crack, you need to replace the heat exchanger or the furnace. This is a requirement, is part of the Fuel Gas Codes and is ultimately not negotiable. My concern is the fact that mechanics walk past other potential carbon monoxide poisoning issues to get to heat exchanger inspection. Then, when they find a minor crack, they immediately shut down the furnace with a disregard for the circumstances, outside temperature or needs of the homeowner. This entire discussion about heat exchangers applies to residential steel, sectional and tubular primary heat exchangers. It does NOT apply to the secondary heat exchangers in high efficiency (90%+ AFUE) furnaces or the Lennox Pulse furnace or commercial equipment. When a secondary heat exchanger develops a leak or crack, carbon monoxide is a possibility. If you have a 90%+ furnace, make sure your service contractor has a calibrated carbon monoxide meter, knows how to use it, and will test your furnace with it. There is some kind of “interaction” between the secondary and primary heat exchangers that creates turbulence that somehow negates the static pressure around the secondary heat exchanger. This allows carbon monoxide to exit the secondary and get picked up in the indoor air stream, I think. What I know for sure is that secondary heat exchangers that have cracks or leaks and are partially or fully blocked will cause a foul rotten egg smell at the exhaust pipe. Carbon monoxide may also detected around the heat exchanger in the bottom of the furnace. If you smell sulphur or rotten eggs at the furnace exhaust, have your furnace checked. Here is more information on furnace heat exchangers.